Betel chewing was prevalent in the southern Philippines as in much of the rest of Southeast Asia. 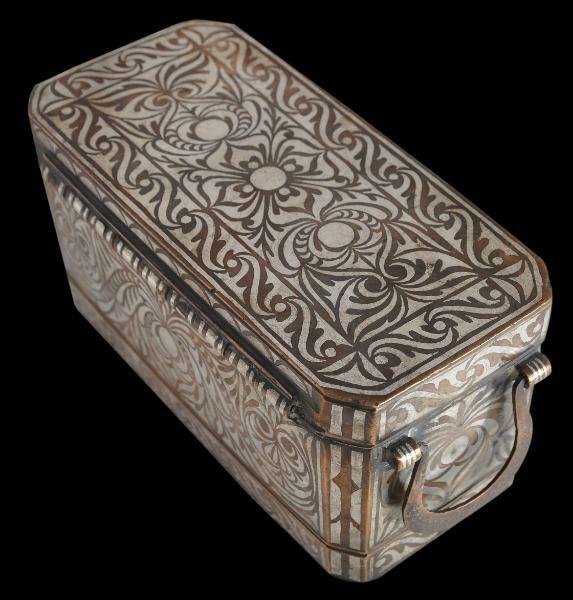 Wealthier Maranao families on Mindanao were able to afford elaborate silver-inlaid brass betel boxes such as this example. 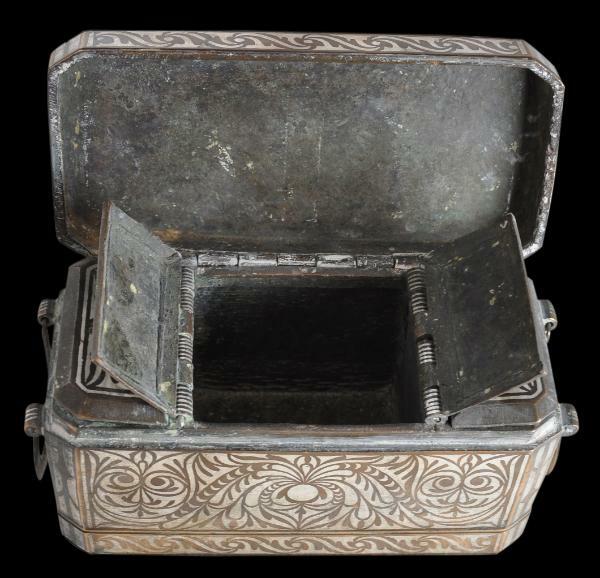 Such boxes were used to show off to household visitors and from which they were offered betel and the other component such as leaves and lime to make up the betel quid. Most extant examples of such boxes tend to measure around 13 centimetres in length. At slightly more than 20 centimetres, the example here is larger than most. 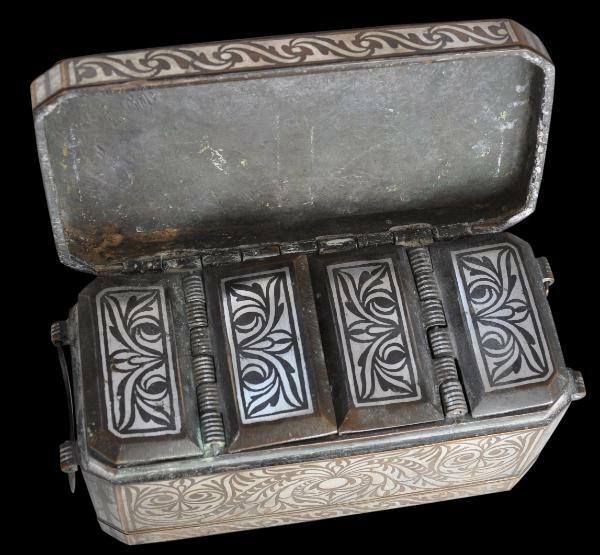 The box comprises a hinged lid and handles, and an interior divided into three compartments covered by four hinged lids. 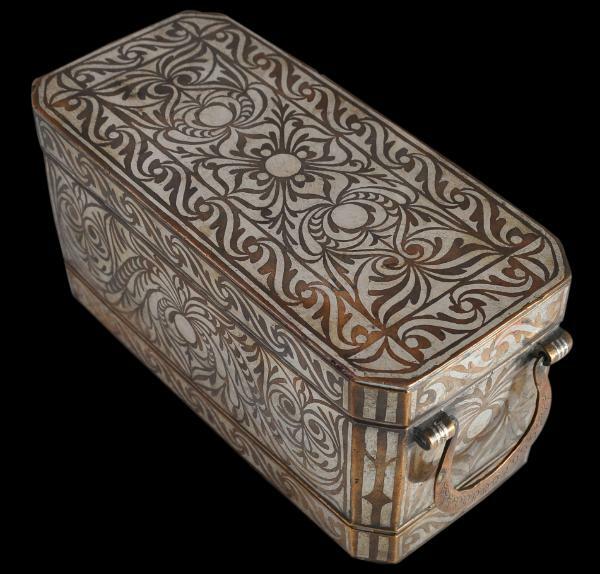 Each of these is inlaid with silver in stylised orchid patterns. obid-obid (stylised rope) borders. 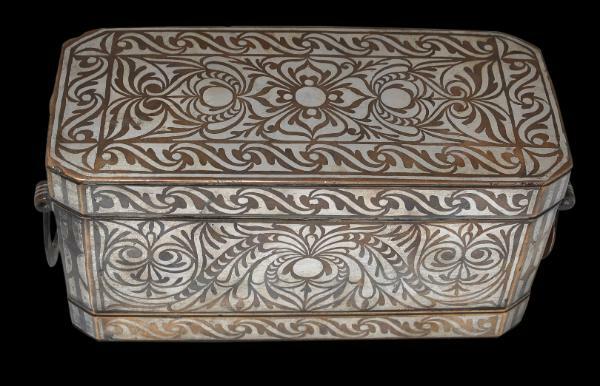 The sides, front and back, are inlaid with sets of stylised tail feathers of the sari-manok bird beneath which are strange, highly stylised zoomorphic faces that appear like cat or tiger faces. (Such stylisation is accounted for by Southeast Asian Islamic preferences to avoid the overt and this potentially idolatrous representation of animal and human forms. 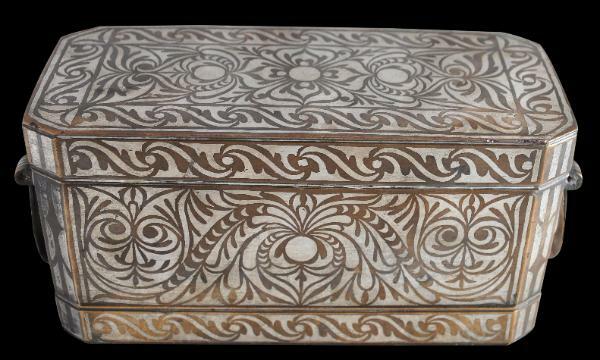 Designs such as these are drawn from a local design repertoire that has its origins in wood carving. lutuan represents a fine example of Islamic metalwork from the most eastern outreach of Islamic art and civilisation: Mindanao island being significantly further east than even China – artwork from Islamic Southeast Asia remains chronically under-represented in the world’s major collections of Islamic art. It is in fine condition with no losses to the silverwork. 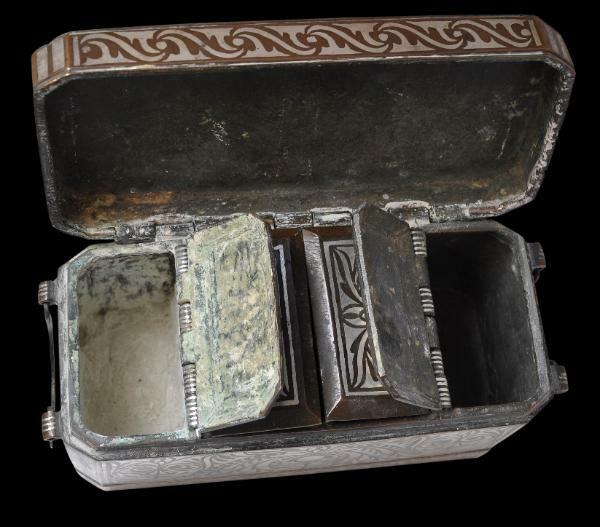 Evidence of use – hardened lime used in the assembly the betel quid – remains inside the lidded chambers. Brownrigg, H., Betel Cutters from the Samuel Eilenberg Collection, Thames & Hudson, 1992.
et al, Land of the Morning: The Philippines and its People, Asian Civilisations Museum, 2009. Betel Chewing Traditions in South-East Asia, Oxford University Press, 1993.